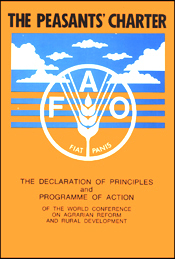 Developed and developing countries as well as the international community as a whole must contribute to the immense effort required to eliminate rural poverty: the rural poor must be given access to land and water resources, agricultural inputs and services, extension and research facilities; they must be permitted to participate in the design, implementation and evaluation of rural development programmes; the structure and pattern of international trade and external investment must be adjusted to facilitate the implementation of poverty-oriented rural development strategies. Growth is necessary but not sufficient; it must be buttressed by equity and, above all, by people’s participation in designing, implementing and evaluating rural development programmes and policies. In the final analysis, the responsibility for agrarian reform and rural development rests with governments and their people - on a political commitment and their determined efforts. But in order to be involved, people need to be motivated and encouraged to recognize the issues and to pledge their unswerving commitment to rural development, with particular attention to the least advantaged. This paper is available on the FAO website [www.fao.org/docrep/U8719E/U8719E00.htm]. There is no electronic version of this book. A portuguese version, elaborated by Brasil for the preparation of the 2006 ICARRD is available in pdf and can be downloades from this page.